According to the City of Portland I’ve had a home based business since September, 1972. That was the month a city inspector appeared at my door and demanded $25 for a city business license. My cranky next door neighbor had called the city to report me for earning income working at home as an author. In my mind, however, I started my home business in 1986 to market a book that the publisher of my books for college students didn’t know how to sell. The Adult Student’s Guide to Survival & Success in College , had gotten terrific reviews when it was published in 1982. But the Holt, Rinehart, & Winston marketing people didn’t understand the new adult student market and wouldn’t try. In three years they sold only 42 copies! It felt frustrating to know that thousands of adult students starting college were floundering while a valuable resource sat in a Holt warehouse. My co-author and I revoked the copyright. I purchased the existing inventory, established the Practical Psychology Press and started marketing the book. Since then I switched to a different co-author, learned how to hire a cover designer, obtained ISBN numbers from Bowker, found an excellent book printer, and revised the book several times. My company now sells thousands of copies a year to very appreciative students. When I started the company I didn’t know that my efforts to learn how to publish and market a book would have an unexpected benefit. In 1992, after twelve years of having my manuscript on The Survivor Personality rejected by major publishers, I realized that since I had a publishing company I could publish and market it myself! So I did. Do you recognize the pattern here? Frustration with others not understanding what is obvious to you? Strong feelings of self-reliance? Feel compelled to do something important? Have a belief that you can learn whatever it takes to succeed? That you can overcome adversities and difficulties? The following checklist describes personal traits I see in people who have a better than average chance in establishing and succeeding at running a home based business. See how you match up. In a previous job I attempted to explain how something could be done better, and felt frustrated because no one understood me or would follow my suggestions. I was criticized for "making waves" or not being a team player because of my efforts to make things work better. As an employee I felt underpaid for the many contributions I made to the main purpose of the organization while others were overpaid for contributing little that was really useful. When working on a project I get so involved I work late into the evening and much of the weekend. I find that to have things go well I have to do a lot of little things myself. I will do any job related to making things work well. I will do whatever it takes to meet a commitment. When something goes wrong I look carefully at why, learn from the experience and do things differently the next time. I am self-reliant. I have learned I can count on myself more than most others. When hit with a setback I see it as temporary, but surmountable. I adapt quickly to new developments and changes in the world. I have a complex, paradoxical inner nature. I am both creative and well organized, relaxed and intense, logical and intuitive, optimistic and pessimistic, calm and emotional, task oriented and people oriented, serious and playful, etc. I am curious. I ask good questions. I want to know how things work. I experiment, make mistakes, and laugh about discoveries. I anticipate and avoid problems. I can think in negative ways to reach positive outcomes. I need and expect things to work out well for myself, my family, my customers, and my community. I have a synergistic effect on my part of the world. I have good empathy skills. I listen well and comprehend what others think and feel. I welcome feedback about my actions and my product. I am good at what I do. I conduct myself professionally and ethically. I focus on getting results and can make difficult jobs look easy. I trust my intuition and creative hunches. I defend myself well. I have strong self-esteem. I have a talent for serendipity. I convert misfortune into good luck. When knocked off track I ask myself, "How can I turn this around? Why is it good that this happened? What is the gift?" The thousands of people starting home based businesses confirm my belief that a new breed of person is emerging on earth. Such a person is of higher value doing self-created work instead of a job thought up by others. This person is both independent and committed to service, highly flexible, constantly learns, and gets better and better every year. Internet Special! Highly resilient small business owners have a much better chance of surviving and thriving than those who are less resilient. When you are resilient, you hold up under non-stop pressure, bounce back quickly from setbacks and convert misfortune into good luck. 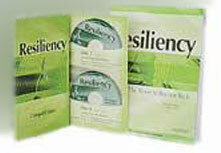 As a small business owner myself, I am so deeply committed to helping small business owners succeed, I’ve arranged for small business owners to receive a deep $30 discount — discounted to $99 [Regularly $129.00] + s/h) on my Personal Resiliency Learning Course (Audio CDs with manual) when ordered through Practical Psychology Press. Resiliency is a powerful talent to acquire. This course will help you become highly resilient quicker and easier than through any other process. When you place your order, use the discount code: "small business" in the discount code field of the order form.